Does anybody know the station at 6:00? Yes I think you’re right. Train going into the siding? Spot on shunt move from platform 3. The tunnel lights being fixed to the roof gives it away being little changed to this day. Quite an interesting lightbox display they have there at Elephant & Castle - what the do the four quadrants represent? Piccadilly Circus, on the other hand, appeared to already be fitted with DMIs... the same type still on the platforms there 32 years later! Quite an interesting lightbox display they have there at Elephant & Castle - what the do the four quadrants represent? It’s not very clear from the footage but those type of indicators had a divider box for every pane of glass that had a destination. They were, at the time this footage was taken somewhat redundant with the destinations on the Stanmore branch and those up in to S.Herts no longer in use. Here is a photo from spsmiler ‘s collection showing a almost identical describer for a through station (Baker St I think). Elephants light boxes had, “THIS PLATFORM” & “OTHER PLATFORM” indications being a terminus. I thought (perhaps wrongly) that Piccadilly Circus gained new DMIs as part of the semi-refurbishment done by Metronet. When DMIs were first introduced on the Bakerloo there was no real Train Describer system for them to take destination information from; so the default destination was 'SOUTHBOUND BAKERLOO TRAIN'. 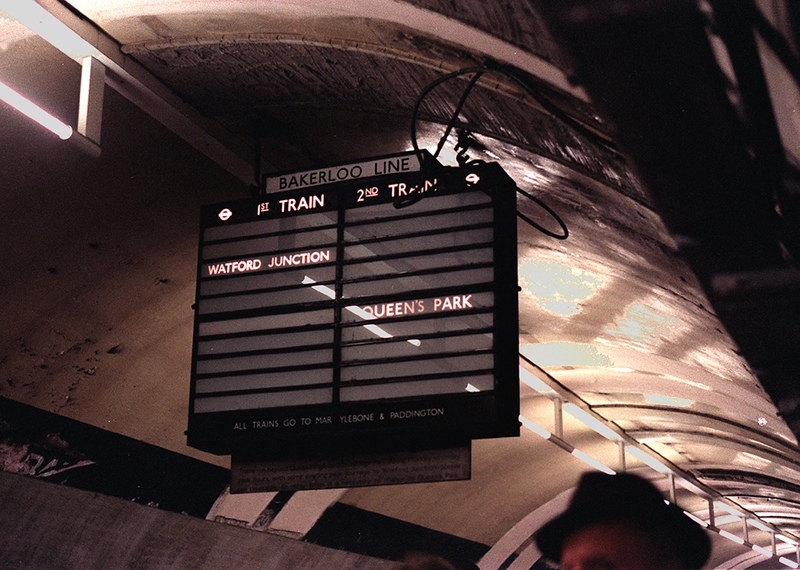 This was corrected in around 1991 when the line was fully resignalled and control transferred to Baker Street.